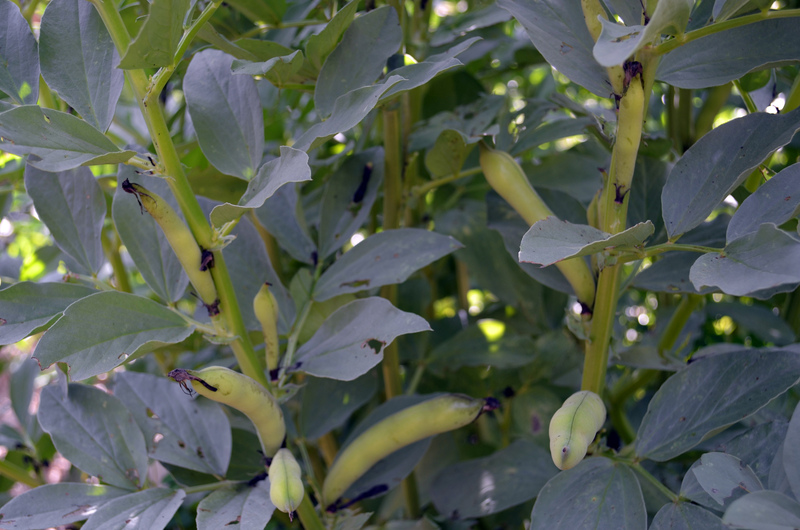 This is the second season we’ve planted fava beans (aka broad beans); we really enjoyed what we harvested last year and definitely wanted to include them again this spring. While all the plants survived the winter, each freeze tended to disfigure the soft hollow stemmed plants a little more. The main stems would crimp then fall over but the plant would survive and eventually regain any tender foliage lost to the cold. The plants survived but by spring the beds were a tangled Medusa head of chaos and flowering didn’t really occur until the weather started warming up. So this year I skipped the cold (I thought) and in February I planted fava beans (“Windsor”) saved from last year’s crop. The ground wasn’t frozen but was still quite cool, so the seed lay dormant in the ground for over three weeks before gradually sprouting about the time I was giving up on them. They handled the last few frosts and a light freeze or two and by late April the healthy plants were covered with flowers up and down the mostly straight stems. Here in the middle of May we are about ready to begin what should be a very good harvest for fresh consumption in salads and pasta dishes while the summer garden continues to fill in. At some point this week I’ll wander out for my fist serious fava search & rescue mission of the year; they hide well among the leaves and stems, especially when dummy gardeners plant a full 4’x8′ bed on a 6″-8″ grid. Broad Beans or fava as you call them are so worth it though. Delicious! Taking the skins off is a chore though. Hey Bruce, Brent up here in Prince Edward Island, I just scrolled waaaay back yo your Poblano post and was very envious. Any Hot peppers this year?